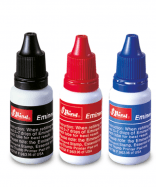 We offer refill ink in 3 sizes: 1/2 oz, 1 oz and 2 oz bottles. Bottles may vary from product image as we buy ink in bulk and transfer it into smaller containers. This ink is for pre-inked and pocket stamps only. Please review the instructions on your box or on our “How To” page under the Information section of our website before adding ink to your stamp.